A few days ago, I had a birthday, and my blog had a birthday too, the same day actually!......I have found myself feeling a little closed off lately. Finding it hard to share here, getting stuck over commenting, wanting to connect but not really feeling able to.......sometimes wondering what it's all about. Wondering if I still can. Without telling it all.....which I can't. Because the story belongs to someone else too. But you will know that life in the teenage parenting zone isn't easy a whole lot of the time. Some birthdays we decide that they are not really going to touch us. We decide it's really just another day. It's just not that important. That's what I decided. And for anyone without a significant other adult in their life and a sick and coughing teenager in bed, it seems like the best thing. Until I saw this bunch of Peonies in the supermarket......as I was leaving. Now I don't usually buy cut flowers, unless they are cheap and cheerful Daffs, I love wild flowers and the blossoms and just what I can find growing. But these stopped me in my tracks and for some reason they were reduced......and I knew they would be coming home with me. 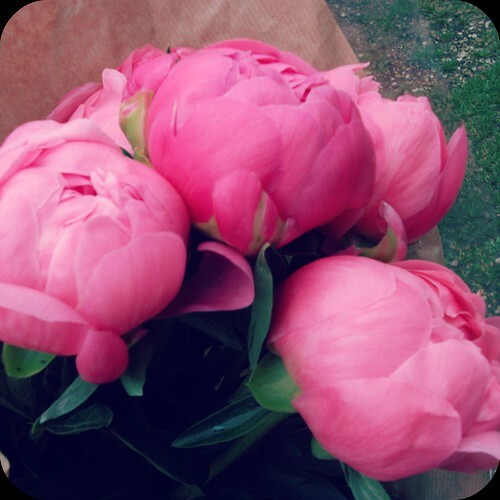 So I stood there in the queue, clutching my prize Peonies. Trying not to look for all the world like I was buying myself flowers.......and I know what your thinking, but why on earth not!......but that's just how it was. And while I was stood there I saw a sweet looking couple come in, with arms linked together, they looked so lovely and I swear they were almost promenading the supermarket!......I knew them vaguely. Warm humorous and very dapper, they steered themselves straight towards me and my Peonies.....whereupon, I found myself whispering that I was indeed buying them for my birthday......and from him being of the gentlemanly kind, I found myself bestowed with a very proper birthday kiss......That I totally hadn't expected.......and threatened hugely to crash through my defences. Right there and then. The tears stung and hung there. I felt the heat and emotion burst through...... I did make it to the car before blubbering......the universe had found a way to bring me flowers and a birthday kiss! Some people are able to make little bridges and find the well needed chink in our armour....... don't you think? and then the light can come flooding in. 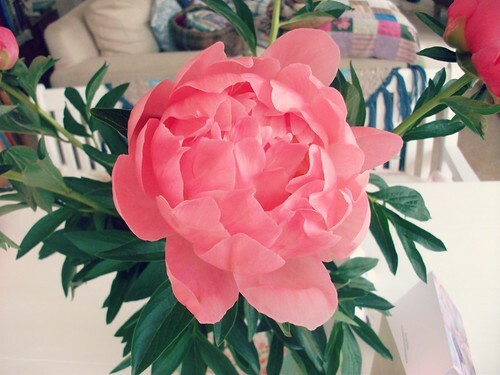 All day I marveled at the sweetness of these Peonies and that delicate spot they had reached into. Like a sweet soft feathery flamingo kiss! They made the day. You know when your expectations are greatly reduced, the smallest gestures can be so powerful. 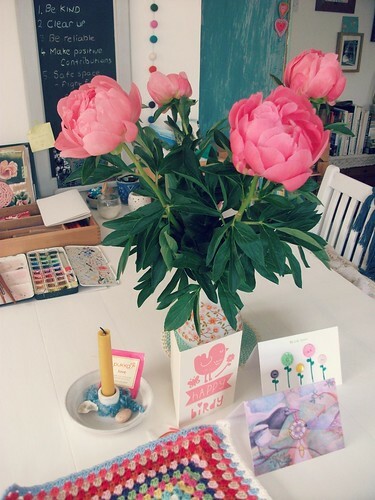 and I heartily recommend buying yourself flowers on your birthday and chocolate too! True beauty's and many happy returns. Lovely flowers and you certainly deserve them. Happy Birthday! I know what you mean about the privacy and teenagers, I regret oversharing about mine and am considering deleting some of it. The flowers are beautiful and you deserved them. Happy Birthday dear Heather. Your flowers are beautiful and your words are too. I hope this coming year is kind to you and yours. You were so good in the way you told your day and your feelings Heather….. Very brave and yes you need to leave your armour somewhere…. forget about it from time to time! Sending you a birthday hug Heather :-) ...and one for each day of the year ahead. That will stay with me, what you wrote about our expectations. Sending you love from Cornwall. Happy belated birthday to you and your blog. Difficult teenage days are behind us...oldest is now 25 and one of my best friends. That was not the case 10 years ago. It does get better. Sending you hugs today. Happy belated birthday! 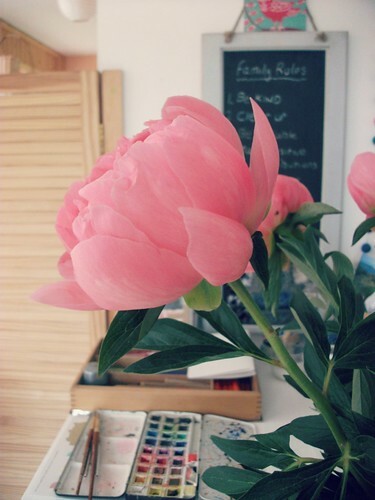 The peonies are beautiful, and I'm so glad you splurged and bought them for yourself. The timing of the gentleman at the store couldn't have been better. Sometimes it is the smallest kindnesses that mean the very most. Hugs to you and happy birthday, Heather. What a great cheerer-upper - and a belated happy birthday!! And yes, difficult teens drive one to distraction - I am cooler with my 3rd now that the older 2 have turned out so lovely as adults, yours will, too, I'm sure!! What a beautifully written post, and brave of you to bare your soul. 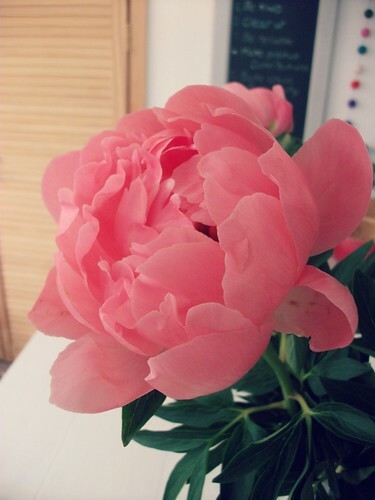 I love peonies, they are such brazenly beautiful blooms. Serendipity at the supermarket too, on your special day. I want to hug you too! 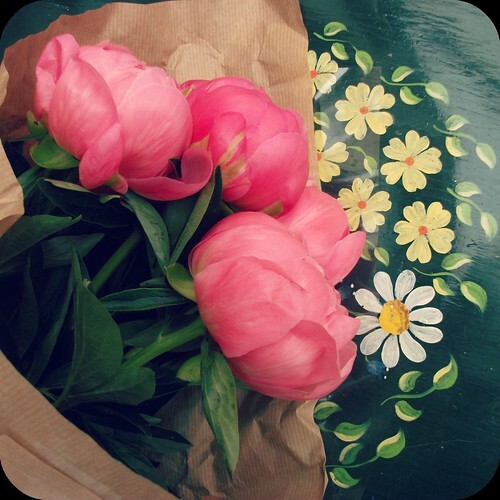 Well done on buying yourself such gorgeous flowers - you do indeed deserve it. 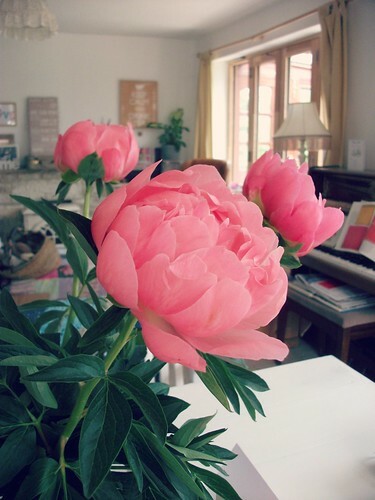 Peonies are so glamorous and for some reason when they're in the house you just have to keep looking at them. And it's lovely to read a post where someone opens up. I do it (very) occasionally then panic about over-sharing. But as a reader it's good to know more, to understand, empathise and connect. Sending you my very best wishes! Hello Heather, I have just stumbled on your blog via Stephanie. I don't blog-surf very often but somehow you know how it is - sometimes you come across the name of a blog or that little thumbnail picture and you think "I'm going to click into this one, I have a good feeling". Well it just happened and I'm so glad I did! I started reading your posts and couldn't stop ...you have a beautiful blog and your writing chimes with me. I hope you don't mind if I add you to my blog roll ...? I hope you are feeling better and the sun is shining in the Cotswolds:-) oh and Happy Birthday! What a lovely, honest post. A huge happy birthday to you, and yes, we should treat ourselves every now and then. Sending you a belated birthday kiss.